Magaram Center Peer Mentorship program. Photo submitted by Annette Besnilian. 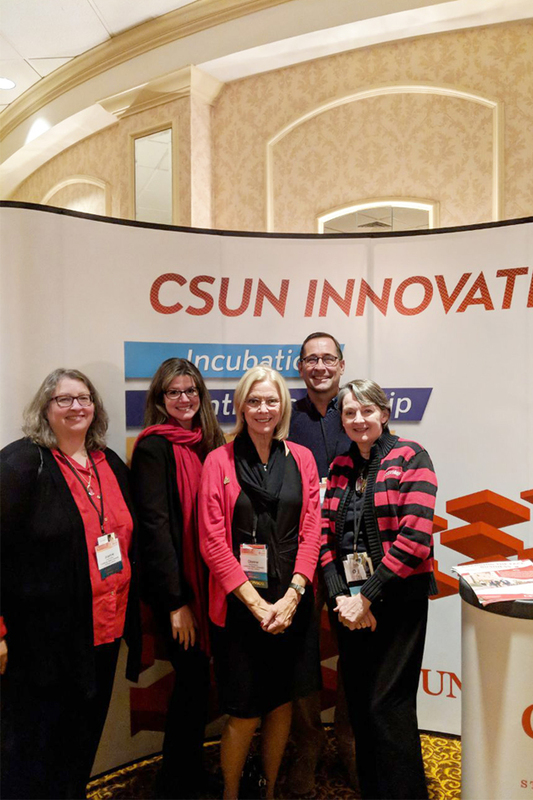 Joanne Scillitoe, the Nazarian College Paul Jennings Chair in Entrepreneurship; Sherry Sidick, Tseng College associate director of external relations; CSUN president Dianne F. Harrison; Tim Tiemann, managing director of the CSUN Innovation Incubator; and Julia Potter, director of external relations and Special University Projects, at the CSUN booth during the UEDA Summit 2018. Photo submitted by Tim Tiemann. 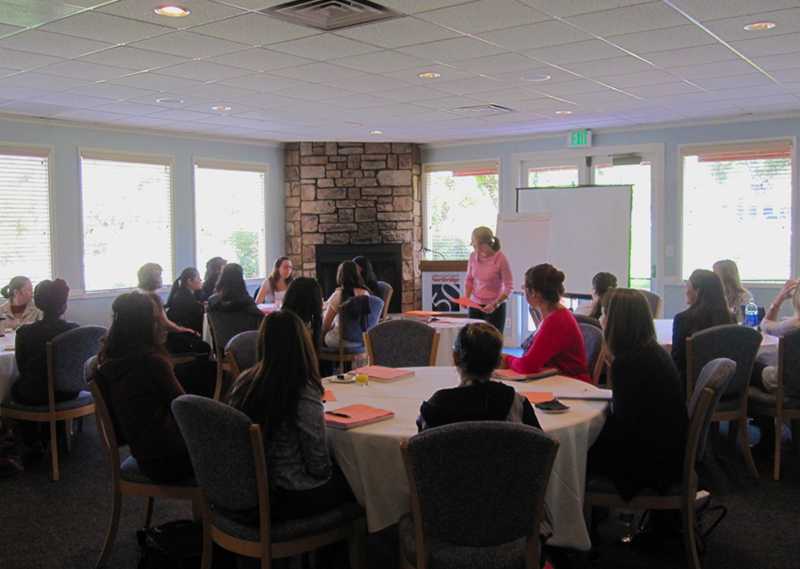 Magaram Center Executive Director Annette Besnilian and Associate Director Karmen Ovsepyan with the participants of the Magaram Center's Peer Mentorship program. Photo submitted by Annette Besnilian. California State University, Northridge brought home two awards from the University Economic Development Association (UEDA) Annual Summit, which took place Oct. 21-24 in Milwaukee, Wis. The David Nazarian College of Business and Economics won the Talent and Innovation Award for its Summer Accelerator program, and the Marilyn Magaram Center for Food Science, Nutrition and Dietetics’ Peer Mentorship Program received the organization’s Editor’s Choice Award. UEDA’s Awards of Excellence are granted to initiatives that have excelled in demonstrating higher education economic engagement, in order to encourage the adoption of similar projects in other campuses and communities. The CSUN Summer Accelerator captured the organization’s Talent and Innovation Award, which recognizes projects that foster innovators who are working to solve existing problems. The Summer Accelerator is a nonprofit incubator developed to support new CSUN-affiliated business ventures. In June, the program invited a highly selective cohort of eight student teams composed mostly by two- to three-person tandems (from an original pool of 60 applicants) to participate. The teams followed a 10-week curriculum that provided access to expert mentors and guidance in creating company logos, promotional videos, investor presentations, product designs, pricing and distribution. Workshops about competitive research, financing and legal matters also were integrated to further the teams’ knowledge and help move their startups toward launch in the marketplace. Tim Tiemann, managing director of the CSUN Innovation Incubator and head of the Summer Accelerator, said a key factor in the success of new ventures is engaging with the audience. Program faculty and staff helped the startup teams conduct more than 100 in-person interviews with potential customers. “The Summer Accelerator benefited me in multiple ways,” said Tyler Valentine, a junior majoring in Political Science who developed an idea for a mobile app alongside co-founder Adam Rodriguez, a Finance major. The accelerator helped the team grow as young entrepreneurs, and the workshops and hands-on experience helped equip them to turn his “idea into a corporation,” Valentine said. The team’s startup, Bookmark, is an app designed to integrate students into their college or university community by connecting them to study groups, informing them about helpful resources and notifying them about on-campus events. The idea, according to Valentine, was realized after they conducted more than 300 interviews with professors, CSUN peers and administrators from different colleges to learn how their app could help address some of the issues causing low retention and graduation rates. Beyond helping the group polish their concept and develop the app itself, the Summer Accelerator supported the venture’s future growth. Bookmark is set to be beta-tested — to undergo its trial run with actual users — in the classrooms of CSUN’s Nazarian College, College of Social and Behavioral Sciences, and at several other colleges and universities in California, such as Loyola Marymount University, in the spring 2019 semester. The program encouraged and prepared the young innovators for current and future entrepreneurial ventures, Valentine said. “The [UEDA] award is a testimony to how excellent the program is,” he said. The Marilyn Magaram Center’s Peer Mentorship Program to Promote Diversity within the Nutrition and Dietetics Profession also was nominated for the Talent and Innovation Award. The program was selected by the UEDA’s Journal of Economic Development in Higher Education (JEDHE) to win the Editor’s Choice Award for that category. The Editor’s Choice is a new award opportunity at this year’s UEDA Summit granted by JEDHE to extend recognition and exposure to other deserving nominees. Responding to the increasing number of chronic diseases within the community, the Peer Mentorship Program was a way to address the consequent need for more bilingual and culturally diverse registered dietitians who can assist more diverse members of the community. 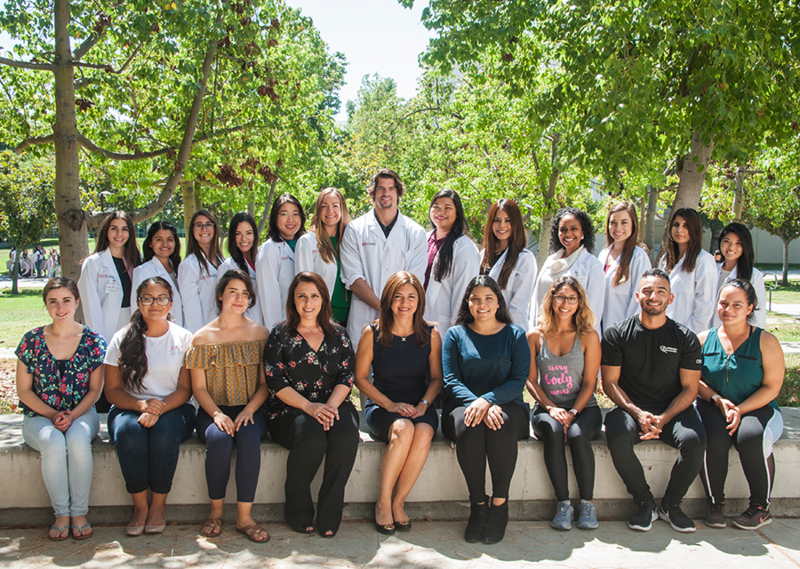 According to Annette Besnilian, executive director of the Magaram Center, national data show a lack of culturally diverse students getting into dietetic internships, which is a necessary step in the course of becoming a registered dietitian. To increase diversity in the field of dietetics, the Peer Mentorship Program connects graduate students who are currently dietetic interns (and thus have recently completed the same process) with culturally diverse individuals (peers) who are in the stages of applying to the dietetic internship program. It functions by providing workshops and one-on-one counseling with mentors in order to pinpoint specific challenges in their application process and, in turn, efficiently remedy them. Peer mentors provide support and guidance throughout the preparation and application processes. The program has received recognition from the Academy of Nutrition and Dietetics and from California State University chancellor Timothy P. White. Now with recognition from UEDA and JEDHE, the Magaram Center looks to expand its ability to provide opportunities to its students through successful programs even further. Thanks in part to collaborations between Besnilian and health sciences professor Merav Efrat, the lactation program has earned a $1 million grant from the United States Department of Agriculture (USDA) to fund scholarships, lactation education, the Peer Mentorship Program, faculty mentoring and research and educational opportunities through the Pathways to Success​ program.